It seems like it was always going to happen, but it’s finally upon us. Virtus.Pro has fallen in the world rankings enough for AGO to take over and claim the title for the number 1 Polish CS:GO team in the world. 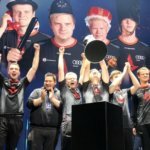 The events leading up to this change in rankings tell two different stories – the incredible come-up of the new Polish superstar team AGO, and Virtus.Pro’s devastating fall to rock bottom. Here’s a look at what has helped the recent ranking changes happen and where AGO needs to go next to step up their game further. It happened on May 28, 2018. AGO went up against Virtus.Pro in the group stage of the StarSeries iLeague Season 5 tournament. The odds were pretty even, with most betting sites expecting the odds to be roughly 50/50 either way. However, AGO came out on top with a triumphant 2-0 victory against Virtus.Pro. AGO’s top performer, Snatchie, performed incredibly well, whilst the rest of his team held their weight as well. On the other side, things weren’t looking so hot for Virtus.Pro. Michu and Snax tried their hardest to carry the rest of their team but they just couldn’t manage. It certainly wasn’t a close battle, though. AGO only came up on top with a 5 round lead. They won 19:17 in overtime on Train first then pulled through with a 16:13 victory on Inferno. This is, of course, just one of many group stage events for the StarSeries iLeague Season 5 tournament, so the overall results aren’t massive. However, this matchup was an important milestone for AGO’s future and potentially the demise of Virtus.Pro’s current roster. VP has struggled to perform against nearly every time whilst AGO has slowly been trading punches with heavyweight teams like Fnatic, North, and Mousesports. With AGO taking the new number one spot for Polish Counter Strike, they’re sure to turn over many lifetime Virtus.Pro fans. The question is, will AGO ever get past their current spot in the world rankings? AGO are still only at spot #20, which is a long way away from being good enough to regularly battle and win against other top tier teams. AGO still needs to prove themselves to be better than other tier 2 teams. Right now, they sit alongside the likes of Space Soldiers, GODSENT, NRG, Renegades, and Tyloo. These are all teams that manage to make it to big events, but they fail to get very far when fighting against the world champion teams. If AGO can overcome these teams like they have Virtus.Pro, however, they may finally be in a position where they can practice and scrim against the likes of Astralis, Fnatic, FaZe, and Mousesports regularly enough to learn from the best. It’s at this point that AGO has the chance to take the world by storm. By looking at their most recent performances, we think AGO has a good shot to be amongst the best this year so make sure to keep an eye on them.